Amazon’s fake holiday is back again this year. In an effort to get you to join Amazon’s prime service they are offering some pretty good deals. They are offering a bunch of crap too, so allow me to point you in the direction of some of the good ones. The Kindle Paperwhite is $90 and the regular Kindle is only $50. I haven’t tried it, but the Amazon Echo is getting rave reviews. Today it is $50 off. This Coleman Roadtrip Beachshade is only $30 and perfect for camping, soccer games and days at the pool. The Philips Hue White and Color Ambiance Starter Kit is a great way to set the mood in your living room or bedroom. %50 off today. I prize my cast iron skillet and these Premium Stainless Steel Chainmail Scrubbers are cheap at only $12 (50% off). I use one of these SanDisk Ultra 200GB Micro SD cards to nearly the double the size of my laptops 256GB solid state drive. $59 is a great deal for these. This Samsung UN55KU6300 55-Inch 4K Ultra HD Smart LED TV (2016 Model) is a steal at only $550! Whoa! (As of posting this hasn’t gone on sale yet. Check periodically throughout the day). There are tons of other deals you might be interested in but you need an Amazon Prime membership to take advantage of the sales, so sign up for a free trial now if you haven’t already. Since October 1st, elusive street artist Banksy has been leaving his mark in New York during a month-long residency called “Better Out Than In“. This weekend, as part of his live exhibition, Banksy set up a stall in Central Park where an unknown man sold “100% authentic original signed Banksy canvases” to the general public for $60 each. 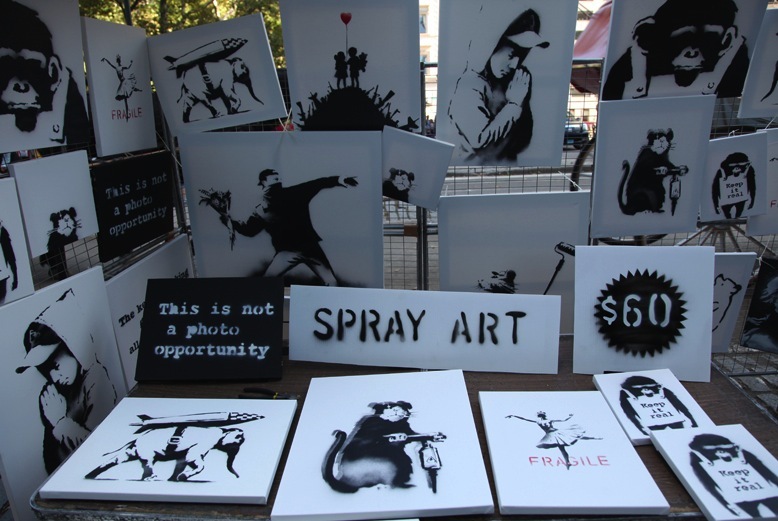 The stall contained about 25 spray art canvasses – eight paintings were sold (two were bargained down to $30 each). For comparison, in 2007 Banksy’s work “Space Girl & Bird” was purchased for $576,000, and in 2008 his canvas “Keep it Spotless” was sold for $1,870,000. The BBC estimates the pieces sold yesterday could be worth as much as $31,000 each. Accompanying video can be seen on BanksyNY youtube account. Now through November 29th, Amazon.com is offering $3 of MP3s for free with coupon code “GET3MP3S”. (If you don’t see a box on the checkout page at Amazon, click on “Redeem a gift card or promotion code & view balance” on any album page to redeem this credit.) It applies a credit to your Amazon.com account, which can be used to purchase any MP3 of $3 or less in the Amazon MP3 Store. 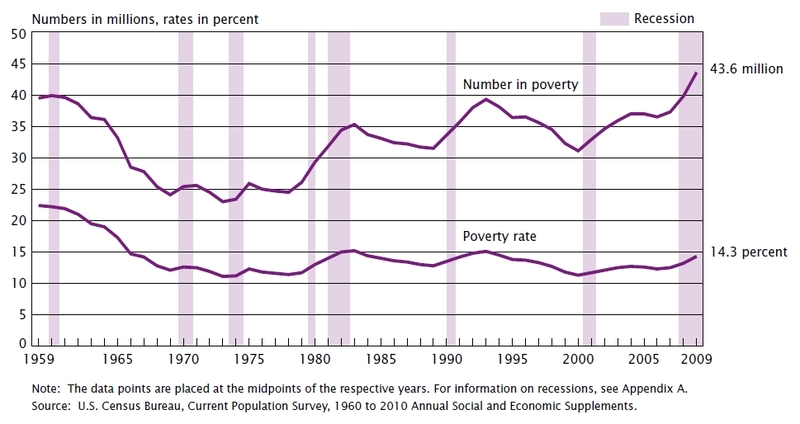 This is what a rising poverty level looks like. Bill Simon (Head of Wal-Mart operations) says more Americans paying necessary goods with government assistance. The desperation in the U.S. consumer can be seen in their current buying behaviors. The paycheck cycle we’ve talked about before remains extreme. And you need not go further than one of our stores on midnight at the end of the month. And it’s real interesting to watch, about 11 p.m., customers start to come in and shop, fill their grocery basket with basic items, baby formula, milk, bread, eggs, and continue to shop and mill about the store until midnight, when electronic — government electronic benefits cards get activated and then the checkout starts and occurs. And our sales for those first few hours on the first of the month are substantially and significantly higher. And if you really think about it, the only reason somebody gets out in the middle of the night and buys baby formula is that they need it, and they’ve been waiting for it. Otherwise, we are open 24 hours — come at 5 a.m., come at 7 a.m., come at 10 a.m. But if you are there at midnight, you are there for a reason. And we have to look at that and we have to watch that and we have a commitment to serve those customers who need that. And we are very, very focused on that. I think this says a lot about the tepid U.S. economic recovery (or lack thereof). You can download a full transcript of the the talk Simon gave at the Goldman Sachs Retail Conference last week. I have noticed that recently, a lot of the indie bands that I have discovered for myself – I say for myself because nobody I know listens to these bands, I hope you do because they’re rockin’ – are starting to show up on television. I first noticed this when I Am The World Trade Center had a portion of a song played on The Surreal Life. A couple of weeks ago I saw a song by one of my favorite indie bands, Papas Fritas, on a Dyntyne Ice commercial. I mention this only because a great band called Brassy is playing at the Bluebird tonight. Brassy currently has a song that is being played on a Motorola commercial. For all you in Denver with nothing to do tonight, go check it out. Muffin Spencer, younger sister of Jon Spencer (Jon Spencer Blues Explosion) rocks the mic and it’s bound to be a great show. I’ll make it if I can.